The snare drum is not only the most important drum of the drum kit, but it's the most important instrument in a song as well (besides the vocal) since it provides both the backbeat and the energy. That's why it's important for every engineer and producer to know as much about making the snare sound great as possible. You can have a killer sounding snare and a wimpy sounding kit and that snare will make everyone believe that the entire kit sounds killer, while a wimpy sounding snare will make even a great sounding kit sound a lot worse than it is. Here's a great video about tuning the snare. It doesn't get into the different heads like in the last snare video I posted, but it's really the nitty gritty of tuning the drum up, which is essential to that killer sound that everyone wants and needs. From the time we were kids, we were all taught that there are three primary colors - red, green and blue. We all know that we can make any color in the spectrum by combining those three colors in various combinations. This 3 color idea has shaped our design world going back centuries, but that's about to change. 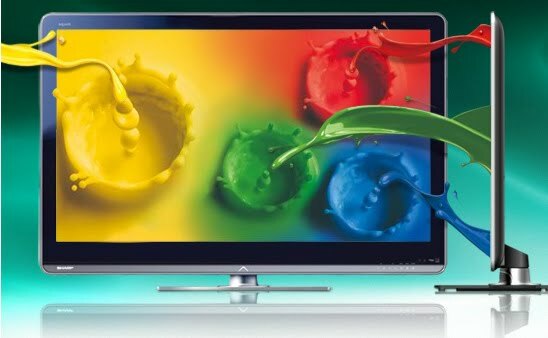 Sharp has announced that it will incorporate yellow as a fourth color into it's new high-end Aquos TV's in order to improve the viewing experience. This new LED technology expands the the possible color gamut from 1 billion to 1 trillion, while increasing the image detail. It's said that you can really tell the difference in any program containing golds and blues, and that the 3D version of the television offers outstanding detail in that format. What does this have to do with audio? A couple of things actually. First, picture is becoming an increasingly important part of audio, with the two coming closer together every day. Audio engineers now have to keep up with the latest in the video world, since you never know when that knowledge might be needed. But the real thing that I wanted to point out is that it's important to question our assumptions from time to time, since sometimes that's the only way to take technology to the next level. What we know to be right today can be become a mere footnote in our learning curve tomorrow. Quick example: we used to think that 0 dBFS was the absolute loudest a digital signal could go with out lighting the Overload indicator until intersample distortion was discovered (transients exceed 0dBFS in-between the samples, causing an overload without the Overload indicator ever lighting). So keep an open mind. A known fact today can so easily fall by the wayside tomorrow. In the meantime, enjoy our new primary color. If you took a survey of music software apps and hardware, I bet that the majority would have a High-Pass Filter on them. Regardless of whether its a microphone, microphone preamp, mixer or console, EQ or DAW app, there's a good chance that a high-pass filter will be incorporated somewhere. Yet, why is it so overlooked? The low frequencies of many instruments (especially guitars) just get in the way of each other and don’t add much to the overall sound. If you roll off the low frequencies below 150 or 200Hz with the high-pass filter on instruments other than the kick and bass, the mix begins to clean up almost magically. Rolling off the low frequencies of a vocal mic can eliminate the rumble of trucks and machinery that you can’t hear because they're so low, yet muddy up the mix. Even rolling off the bass and drums at between 40 and 60Hz can sometimes make the mix a lot louder and punchier without affecting the low end much. So get in the habit of using the high-pass filter. It's a mixer's secret weapon. Chris Boardman has lived multiple careers in the music business. From being a touring musician with Seals and Crofts to musical director for Tom Jones to an Emmy-winning orchestrator and arranger for television and film to composer for major Hollywood motion pictures ("Payback" with Mel Gibson is one of my favs) to jazz pianist to platinum producer, Chris has had enough musical success to fill several lifetimes. I know I'm not doing Chris justice with this short intro, so go to his website for an idea of what a musical powerhouse he really is. In the meantime, Chris was kind enough to answer this week's "6 Questions." Started playing dances etc at 14. Big break came meeting an established arranger/musician named Billy Byers at 18. We developed a very close personal and musical relationship....mentor/protege. Through Billy I did my first professional arrangement (solo harp for Joey Heatherton singing the Minnie Ripperton tune "Loving You". I think I was 19. At 20 I did my first television show as an arranger (a forgettable show). At 22 I left college to become musical director for a Vegas act (Mitzi Gaynor). For the next 6 years we worked elbow to elbow doing a variety of different project. Good question. Something everyone should ask themselves. I mean, if you can't describe yourself to you how in the world can you expect anyone else to figure it out? Recently I was forced to rethink this question, even after all these years. A career is a moving target...you have to evolve or get left behind. What makes me unique? I could go through the laundry list of experience, talent, credits etc but I think the truth about me is this: looking at an abstract (film, song, record, orchestra etc), defining its form, creating a palette, chopping it into puzzle size pieces and then being able to execute (put the puzzle together). I apply this to any project I work on. It doesn't matter what the genre, music, film,technology, business etc. Not sure how unique that is actually. From a purely musical perspective my experience really is unique. I was blessed with having access to the greatest talents from the previous generation who were gracious enough to let me learn from them. This makes me somewhat of a hybrid. Remember, my career started PRIOR to the advent of the personal computer (1974). I'd have to say Billy Byers and all the amazing people he introduced me to and allowed me to work with. From Ethel Merman and Bing Crosby to Julie Andrews and Shirley MacLaine. Second I'd have to say Quincy Jones (who first called me at age 23). Q IS the quintessential producer and inspirational personality. Third I'd have to say David Foster. David and I weren't that close personally but I learned an enormous amount working for him on and off for close to 20 years. After that it would be all the talented film composers Michael Kamen, James Newton Howard, Bruce Broughton, etc. :) I get to do it ...a LOT! Getting out of bed each day is such a gift! Musically? I tend to be a restless soul artistically. Therefore when a situation is no longer fulfilling I move on. Consequently I have had many careers along the way. Studio pianist, musical director, arranger, conductor, orchestrator, conductor, composer, producer, songwriter....etc. I find happiness in just doing the job...being in the process...working with great musicians and artists. Being around talented people is the best. Stay home and get good. People will find out about you. Beyond that, take care of your personal life. It affects everything you do. It’s surprising that so many monitors are chosen on the words of a review or word of mouth, since they’re such a personal item. Here are some things to think about before you purchase a monitor. 1) Don’t choose a monitor because someone else is using them. Monitors are a lot like guitars. Just because Jimmy Page plays a Les Paul doesn’t mean that it’s right for you. It might be too heavy for your frame, the neck might be too wide, and the sound might not be a good match for the type of music you’re playing. Same with a monitor. Just because your favorite mixer uses a set of Genelec 1032A’s, it doesn’t mean that they’ll be right for you too. You may hear differently, your hearing experience is different, the match with your room might not work, the match with the type of music you work on might not be ideal, and if they’re unpowered, you may not have the same amp to drive them with so they’ll sound different as a result. Listen for Even Frequency Balance - While listening to a piece of music that you know well, check to see if any frequencies are exaggerated or attenuated. This is especially important in the mid-range cross-over area (usually about 1.5 to 2.5kHz). Listen especially to cymbals on the high end, vocals and guitars for the midrange, and bass and kick drum on the low end. Make Sure the Frequency Balance Stays The Same At Any Level - The less the frequency response changes as the level does (especially when playing softly), the better. In other words, the speaker should have roughly the same frequency balance when the level is quiet as when it’s loud. Make Sure You Have Enough Output Level Without Distortion - Be sure that there’s enough clean level for your needs. 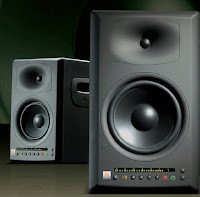 Many powered monitors have built-in limiters that stop the speaker or amplifier from distorting, but also may keep the system from getting as loud as you find necessary. Above all, don’t buy a set of speakers without listening to them. It’s usually very difficult for them to live up to your expectations if you’ve not heard them first. In fact, it’s not a good idea to buy anything unless you’re really in love with them. You’ll have to listen to these monitors for a lot of hours so you might as well like what you hear. 3) Listen with source material that you know very well. The only way to judge a monitor is with material that you’re very familiar with and have heard in a lot of different environments. This will give you the necessary reference point that you need to adequately judge what you’re listening to. I like to use some things that I’ve recorded myself that I know inside and out, and at least one favorite CD that I consider to be well recorded. Remember - no MP3’s here. Use only CD’s or a playback system with an even higher quality 24 bit source like a personal digital recorder. That should give you some idea of the frequency response of the system.